Natures spirits are both magical and ethereal beings, that in northern Europe we labelled ‘Fairies’. They are associated with the four elements: earth, fire, water and air; they are thought of as immortal beings that occupy a place in-between Earth and the Spirit world. Whilst the name might differ, many cultures have an elemental being in their teachings, you might have heard of brownies, devas, dryads, elves, gnomes, leprechauns, nymphs, pixies and sprites. Maybe in your family you use a totally different name altogether? In Celtic folklore they are thought of as petite winged creatures, that are strong and beautiful, that carry out magical and heroic deeds (which they are proficient in). We tend to think of fairies as very sweet influences, which is interesting as many believe that they are actually fallen angels, those that are not sufficiently good to stay in heaven, but equally are not evil enough to be dismissed. But others disagree and believe that fairies are the children of Eve, or that they were created in order to explain misfortunes. 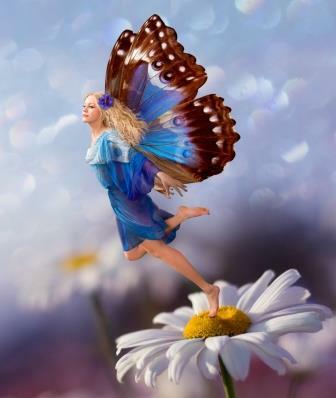 It is believed that only someone with clairvoyant abilities can naturally see a fairy, although on their choosing a fairy can make themselves visible to anyone. In fairy-tales they are generally depicted living in a timeless underground of nature where they dance sing and play. They may now make themselves evident through visions, in order to pass on messages asking us to treat the natural world more generously. Sadly, since the 18th century folklore has recorded a decline in the belief of fairies, which may be explained by pollution, technological advances and urbanisation, but whatever the reason, many of us will still enjoy passing down stories of magical fairy creatures living at the bottom of the garden.